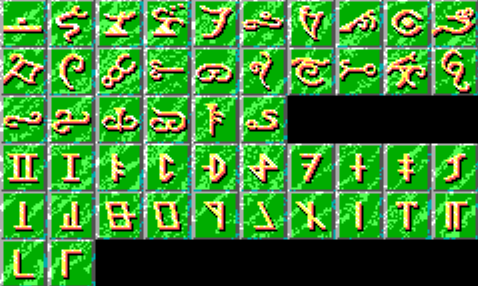 Select one of each the Espruar and Dethek runes to see the resulting codes. I take this as a sign that your conversion of COAB is plodding along? It’s mainly because one of the main source of Google traffic is related to the code wheel. As I have the art work, and the code, I thought I might as well put them together. For ages I have wanted to-do a cool Flash or Sliverlight wheel. But in the end I thought something was better than nothing. Progress is slow and steady. At this point I’m struggling with getting more code working, and changing the UI from a separate thread using Win32 to draw, to a more integrated Managed DirectX approach. I think there are a couple bugs in your calculator, I think it’s mostly from typos in your codewheel variable. 7AZUDE should be 7AZURE. And the one right after it is not 8BONRE but 8BONDS. the R and the D in the 5th spot is transposed. You are right, it was a transposed issue. My original code had those bytes turn into a word, and I put the D before the R, but the D was the high word, and thus should be second. Thanks again for spotting it. You wouldn’t have any idea why I cannot save chars using DosBox, would you? I assume it’s a path thing, just like for this Buck Rogers issue, as it’s the same game engine. So double check the save path in the config file is correct for the paths your are using inside DOSBox. I think your missing some runes on both rings, they should be 36 runes each. While I agree with you in principle, I’m sure I didn’t post all codes, as the game only uses these ones. If you get it asking you a combo I don’t have I’d be very interested to know..